The legacy of Christian Simpson continues on years after he lost his battle to cancer. During his fight his main focus was others, especially younger children who were battling cancer. He held many toy drives while he was in the hospital and after his death, his family is carrying on the tradition. They raise money and sponsor families in need who have a child battling cancer. Their biggest fundraiser of the year is the Christian Simpson Golf Tournament which is happened Sept. 8, 2018 at Buena Vista Golf Course. Christian Simpson was a typical high school senior with dreams of becoming a Highway Patrol Officer when he was diagnosed with Stage 4 Rhabdomyosarcoma in October 2015. He was checked into Valley Children's Hospital for treatment. His birthday was in December and because he was feeling better, he was able to go home for a while. But for his birthday, Christian wanted to do something different. "Christian, on his own, asked that instead of presents for him..." his dad Johnny Simpson said before getting choked up. "...instead of presents for him he asked that he get presents that he can take back to the hospital." Christian would lose his cancer battle in May of 2016, but it was that gesture on his 18th birthday and many more like that encouraged Johnny Simpson and his wife Ashley Simpson to continue on with Christian's work. That's when they decided to start a nonprofit called the Christian Simpson Foundation, sponsoring families with children battling cancer. "They shouldn't have to worry about paying bills or eating and a sick kid. We can't heal a child but we can soften the blow. We can help their heart a little bit and just take a little bit of the edge off," Johnny Simpson said. Breakfast @ 6:15 a.m., shotgun start at 7:00 a.m.
Why: To raise money for the Christian Simpson Foundation. The organization helps support families who have a child battling cancer. Ashley Simpson adding in that there's no price limit on it. She said it's whatever one person needs that they strive to fulfill. It's not just the sick child or the parent who benefits. The foundation also targets siblings who are typically left with other family members or friends as the focus is on the child who is sick. "We ask, what would we be able to do to help ease, any financial burden and struggle they have. What would be their number one thing one their wishlist?" said Ashley Simpson. The Simpsons said most of the families are asking for simple things like clothes, laundry detergent, and hand sanitizer. So far, the Simpsons said they haven't had to turn a family in need away thanks to the generous donations and their biggest fundraiser of the year, the Christian Simpson Golf Tournament. "We both enjoy golfing and just decided that would be a good idea to go from there." said Ashley Simpson. 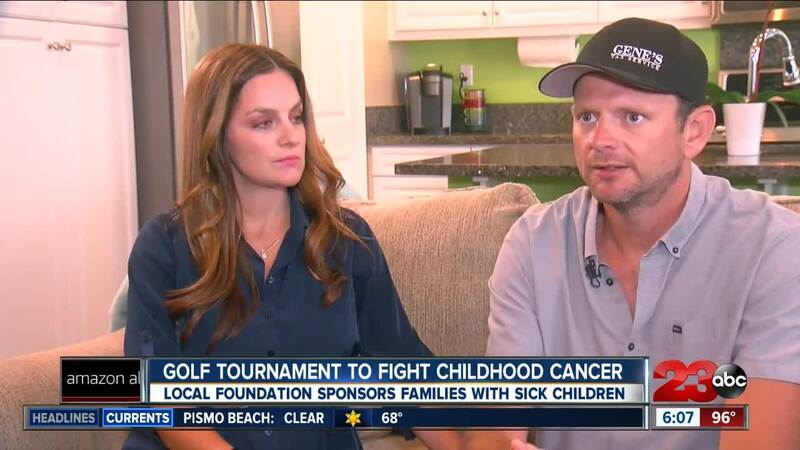 The money they raise from donations and the tournament go directly to families with kids battling cancer and it helps to continue on the precedent Christian set. "What he did on his 18th birthday showed the man he had become," said Johnny Simpson. "It's his legacy and it's very important that it goes on and it keeps it alive and just all the love and passion and selflessness that he stood for, we want to keep it going." added Ashley Simpson. The golf tournament is happening Saturday September 8, 2018. Although all of the participant slots are filled, the foundation is always accepting sponsors, donations and volunteers. Their goal for this tournament is to raise $20,000 which will go directly to families in need. For more information or if you'd like to help out you can contact Ashley and Johnny Simpson at 661-745-4903 or email at info@christiansimpsonstrong.com. You can also check out their Facebook page Christian Simpson Strong here.